In keeping with the festive time of year, we wanted to do a quick round up of how some of our members have used seasonal marketing to raise awareness of gifts in wills amongst their supporters. We have highlighted four below, contributed by our members. We all want to feel appreciated and valued. At Brooke, making supporters feel this is our main focus when we send out our Christmas update. 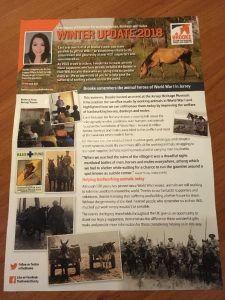 We take this opportunity to look back on the year and reflect on what ‘gift in Wills’ have helped Brooke achieve for working animals. We also thank people who have taken the step to leave a gift to Brooke. Another focus is keeping people informed. We provide details of upcoming events they can attend and ask staff questions. We also champion someone who has generously included a gift in their Will to Brooke by including a quote from them in the piece. For this reason, Brooke have used this as an opportunity to remind people to update their Will. 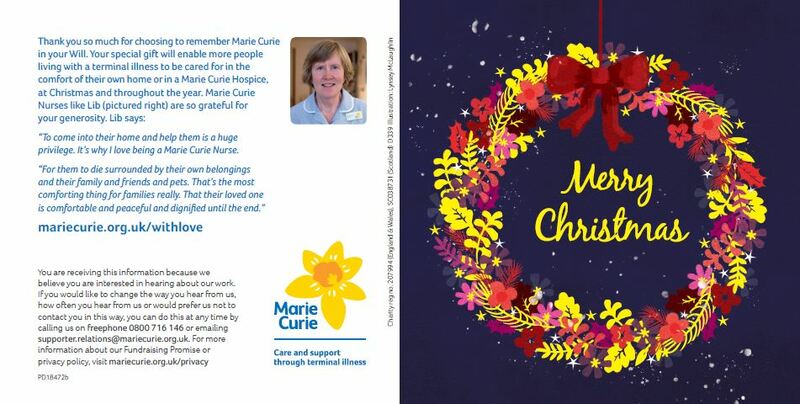 Each year we send a Christmas card to all supporters who have included a gift in their Will to Marie Curie, as a way to give thanks and ensure they feel valued for the generous pledge they have made. 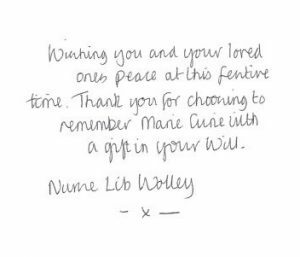 This year’s card came from Marie Curie Nurse, Lib Wolley, whose handwritten message is printed in all cards. 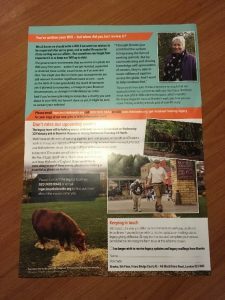 The reverse of the cards features a photo of Lib along with some background information for supporters about her work and the positive impact that gifts in Wills have on the families we provide care and support to. Framed as a New Year’s Resolution, each year Cystic Fibrosis Trust encourage our supporters to think about ways in which they can raise money through a Resolutions booklet – outlining different activities and levels of difficulty. 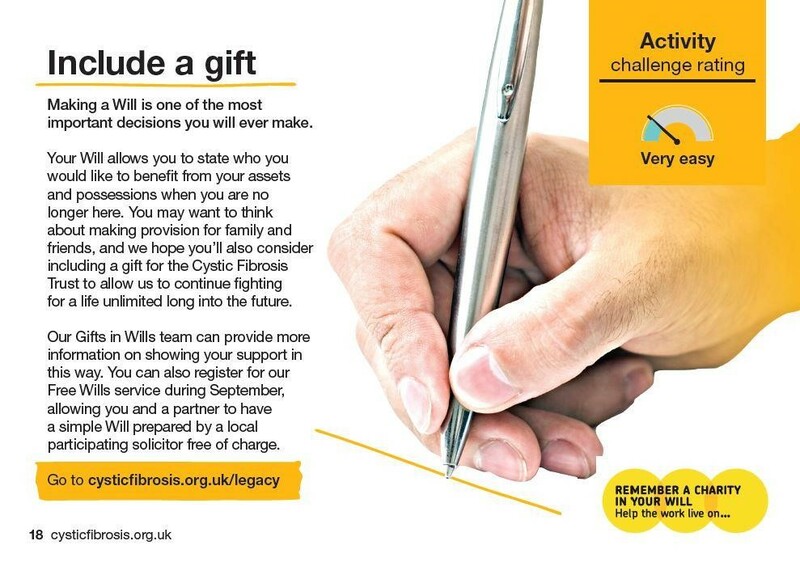 Last year Gifts in Wills were featured as a ‘very easy’ activity with the section focusing on the importance of having a Will and looking after family and friends first. The messaging is simple with a clear call to action as well as an incentive of the Free Wills service during September. The booklet and accompanying web page use the New Year as a platform to empower our supporters to achieve their ‘personal best’ by raising money for the cause. Though not solely a legacy campaign, this is still a lovely example of how a seasonal campaign can tap into people’s generosity at this time of year. Through this appeal, Lord’s Taverners will be able to reach new audiences and potential legacy supporters. For this year’s Lord’s Taverners Christmas Appeal we are focusing on raising funds specifically to support our national Wicketz programme, now taking place in 19 locations, with more on the way in 2019. Wicketz is our flagship programme tackling the effects of disadvantage in some of the UK’s most deprived cities and towns. Aimed primarily at 8 to 16-year-olds, the programme uses cricket to engage vulnerable young people and encourage them away from a potentially destructive path in life. Participants may be struggling with disruptive home lives, acting as young carers, receiving free school meals or in danger of involvement in gang activity. Whatever their background, our local development officers work with them as both coaches and mentors to bring out the best in each young person, building bridges between communities along the way. Supporters of the campaign can sign up for a regular donation or make a one-off gift, and share the appeal with friends and colleagues via networks and social media. Along with beneficiary case studies, the campaign includes short video messages of support from celebrities such as Darren Gough and Jason Isaacs who attended a successful Christmas Lunch event, helping to increase the reach of the Wicketz Christmas appeal even further.